Action. This small word can be strongly defined as “an exertion of power or force” on Dictionary.com. There is no greater example of the kind of action that God calls us to than the Parable of the Good Samaritan. Neither of the religious leaders were willing to exert any energy into helping the beaten man. But a Samaritan exerted as much power as he could to help a complete stranger. How many times does the church walk past those who are hurting and only pray that things will get better? As the hands and feet of Jesus, there is incalculable potential to do something. A few years ago, leaders from First Church of God in St. Joseph, Michigan, traveled to California to listen to Pastor Miles McPherson, author of the book Do Something! Make Your Life Count. This book is about how important it is for the church to be the hands and feet of Jesus and reach out into the community. Pastor David Colp, and Chris Britton, the missional outreach director, were both inspired by this book, and decided to make change a reality in their community. 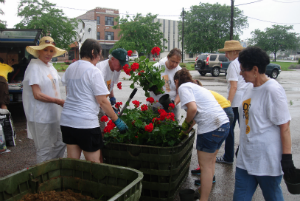 “Do Something” has become a yearly event for the church to spend a weekend to reach outside of church walls to serve and create relationships with city leaders, nonprofit organizations, and others that need a helping hand. This event first began by the church simply contacting the mayor and asking where the city’s greatest needs were, and what they could do about it. At first the mayor was skeptical, but finally told the church where the city was struggling. The church was given the task of painting about five hundred fire hydrants. Though it seemed daunting, David said, “We’ve at least got to try to do the thing they think we can’t do.” Today, those hydrants have been painted twice, taking about an hour and a half each time. With each nonprofit labor hour equaling about $22, this project alone has equaled about $20,000 worth of action. David and Chris encourage members of their church to volunteer about an hour a week, which equals about $1,000 of labor per person for a thousand people, totaling a million dollars’ worth of action. What makes this movement so inspiring is that the church never advertises itself. All they ever want is to give God the glory by “letting their light shine” among the community. They believe that the community should know that there is a group of people who care about them. Although 95 percent of those who are served in the “Do Something” movement are nonprofit, the congregation looks to build relationships with other people who are living by faith to serve others. Two people that the church works to serve own a gym for people with special needs and disabilities. The goal is to keep the movement flexible to whatever needs there are, like preparing frozen meals for shelters, painting, landscaping or making crafts with women from a shelter. The church even serves the local public schools. If reading this article has moved you as much as it has moved me as its writer, check out Miles Pearson’s book; or the book, The Church of Irresistible Influence. Emily Ploetz is a communication intern for Church of God Ministries from Cincinnati, Ohio. She is currently studying English education at Anderson University. Learn more about the Church of God at www.JesusIsTheSubject.org. This entry was posted in All Church of God, Great Lakes and tagged Chris Britton, community service, David Colp, Do Something, Emily Ploetz, First Church of God, Michigan, Miles McPherson, outreach, project, St. Joseph. Bookmark the permalink.